Mrs. Turner had to convince her husband that it was worth it. As a Mississippi farm boy, he was satisfied with renting their nice house in the city. Why leave? Her answer was that they needed their own home. That wasn’t a good enough response for him so he turned his back to her and went to sleep. But Mildred was determined. 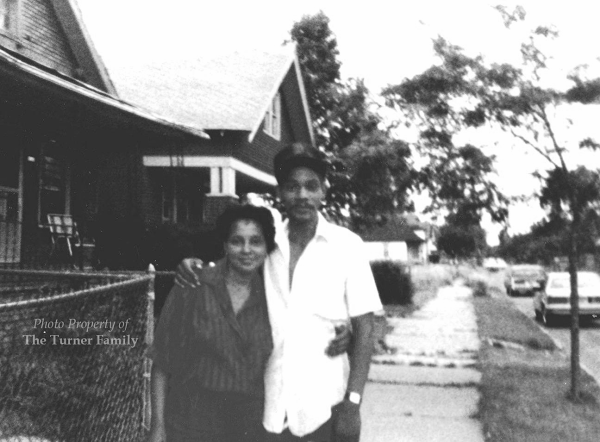 While Mr. Turner was at his plant job, there wasn’t an empty house in Detroit that she didn’t walk through. After finally finding the perfect green bungalow on a lively block on Yellowstone Street, she begged for him to take a look. He gave in. Before they knew it, they were all moved in as homeowners. Even Mr. Turner couldn’t contain his pride. It was 1963. Over 50 years later, a newly widowed Mrs. Turner still lives in the same sea-foam house in a drastically different environment. The cascading trees that lined her block are now chopped down or barren. Neighbors who ran in and out of each other’s homes are long gone, dead, or a hidden mystery. The block’s church and school is grossly dilapidated. Gardens have been eaten up by squirrels. City services are now a luxury. Over time, things became increasingly worse. The remnants of Detroit’s revitalization have yet to touch the Turners’ block. From dilapidation to five generations of offspring, Mrs. Turner stayed on Yellowstone because it is where she built everything. It was just the Turners’ luck that an unkempt convenience store — which they later learned was a front for selling illegal corn liquor — closed two houses down from them. Mr. Turner found out from the Jewish man who owned it that he could buy it for little to nothing. This became the perfect opportunity to open up the ice cream parlor his wife had always wanted. The family laid linoleum and painted every inch of the property. They purchased restaurant appliances and a big, glass popcorn machine to sit in front of the window. Faygo dropped off a cooler so they could sell the company’s pops. The sign they painted on the front read Turner’s Confectionary. By June of 1967, the store was open. A month later, Detroit experienced one of the biggest race rebellions in the nation’s history. Surprisingly, the destruction didn’t touch Yellowstone. While the catastrophic events took place, droves of people were still coming to their block just to see about this new store. The neighborhood raved about the Turners’ coney dogs, 35 cent fries, and famed soft-serve ice cream. And the store’s apartment in the back became a home for many who needed it, especially southern family members who were looking to build a life in Detroit. Turner’s Confectionary not only became a beacon of light on Yellowstone but throughout the entire neighborhood. Heroine soon crept into the neighborhood and altered the future of many of the kids who the Turners watched grow up. Some of the store’s biggest patrons were members of Young Boys Inc. The infamous drug gang did majority of their operations near Turner’s Confectionary and ran into the store daily flaunting expensive clothes and jewelry while buying food. Since many of the young men were kids the Turners knew since birth, they didn’t think much of it at first. But as the gang culture expanded, more members of YBI who had no childhood history with the Turner family circled the store daily. After Mrs. Turner’s son almost got into a fight with a YBI member who cursed at her, she knew they might be in over their head. The impact of drugs on Yellowstone continued on into the 1980s. Now the culprit was crack cocaine. The changing climate of both the neighborhood and its people created an inescapable fear in Mrs. Turner. A few unsuccessful robberies scared her and she knew that eventually Mr. Turner and her sons wouldn’t be around to save her. If that wasn’t enough to worry about, McDonald's and Burger King popped up down the street. Despite their quality being incomparable, the family couldn’t compete with fast-food prices in a struggling community. The couple decided to close Turner’s Confectionary in 1989. Their family grew to a size beyond the Turners’ imagination. By 1997, they had six great-grandchildren. A few empty blocks next to their home became a huge yard that beautified the block. A metal swing set that still rests there to this day held dozens of children. The block remained an epicenter for barbecues and get-togethers with Mr. and Mrs. Turner at the forefront. Years of Easter egg hunts and birthday parties brought hope to the block that was diminishing right before their eyes. In the new millennium, neighbors left one by one. Their houses didn’t last much longer. American dreams built on Yellowstone collapsed into bulk trash spoiling on the curbside. A school facing the block, where most of the Turner grandchildren attended elementary school, was a victim of Detroit Public School closings. Its building was left to ruin with not a child left in sight. The same happened to the church that sat across from their old store. Fish fries and Sunday services moved somewhere else with their building soon becoming another abandoned blemish. The Turners were in their 80s when the block became nearly bare. Family members would softly drop hints to them that maybe it was time to let Yellowstone go too. They deserved better than the left-behind place that no one wanted parts of anymore. But the couple was firm about staying. For them, there was no need to leave the block where their legacy had developed for so many years. No matter the ruin, the Turners kept their house painted freshly green and their landscaping up-to-date. Like only Detroiters know how, they kept going. Raising their fifth generation on the block that grew to become the type of beauty that didn’t have the privilege of being romanticized. 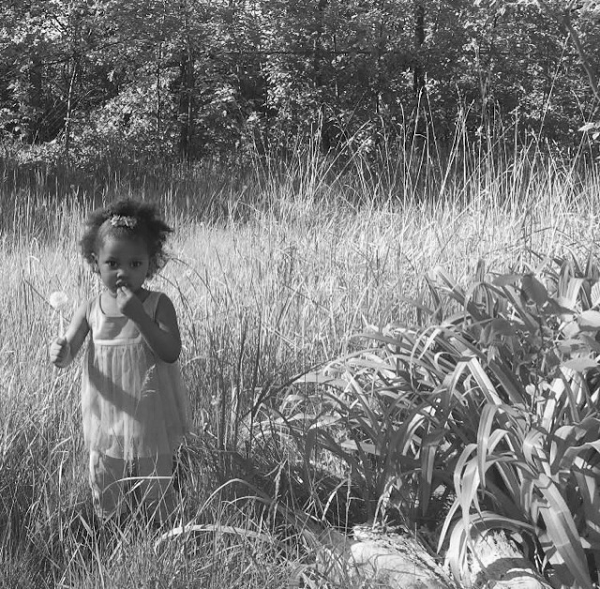 Mr. and Mrs. Turner’s great great granddaughter in a field on their block in 2017. Mrs. Turner is great Grandma Turner to me. When her city girl eyes met those of a migrant worker— their love created my grandmother, who created my mother, who then created me. What I will always place in the context of their existence in my life is Yellowstone. Our summers on this blighted block were heaven to me. As I live downtown, in an apartment that oversees a city lighting up, I can’t help but think of my great grandparents’ block. My home. I couldn’t imagine to have done everything right— built a business, a family, and a community— only for it to be forgotten. When my grandfather died this past spring, I had the opportunity to dive into their lives much more. I was empowered by how they took nothing and changed the lives of so many people on this one block. I realized that there are so many forgotten blocks peppered across this city. These Detroit survivors, like my grandparents, don’t see a better Detroit 50 years after the 1967 Detroit Rebellion. They see one that still hasn’t reciprocated the love they invested in for so many years. But still, they get up each day in the midst of blight and see something more beautiful than any new arena or skyscraper. They see Detroit, and they love her, unconditionally. Shanel Adams’ writing explores the human experience through relevant social justice themes and historical context. She holds a journalism degree from Howard University and has work that ranges from fiction to corporate communications. Shanel believes that writers are nothing without readers and equally aims to strengthen the literacy rate in underserved communities. Her literacy efforts include being the founder and director of Progressionista, a non-profit book club program for Detroit girls. She can be contacted at ms.shaneladams@gmail.com. Posted on October 16, 2017 by Black Bottom and tagged Shanel Adams Detroit Detroit History 67 Rebellion Neighborhoods Black Family Black Entrepreneurs.